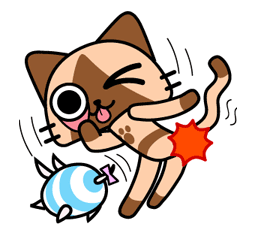 http://www.line-stickers.com/ – AIROU Line Sticker | You like cute animals? Well you’re gonna love AIROU from the Monster Hunter game! Just look at those sparkly, beady eyes… and all those emotions! Fan favorite Airou from the Monster Hunter series returns with a brand new set of animated stickers! Squee with glee as the ever-adorable Airou, Merarou, and Pugee smile, pout, and otherwise emote their way into your chats! Copyright : © CAPCOM CO., LTD. ALL RIGHTS RESERVED.